This is a good all-purpose, dark, spicy gingerbread. It’s tasty, keeps well, and is sturdy enough to use for everything from gingerbread people to gingerbread houses. For cookies that will be eaten, use butter for the best flavor. 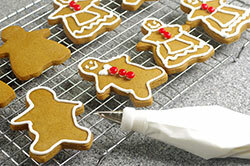 For gingerbread houses or other decorative cookies that probably won’t be eaten, vegetable shortening can be used. COOKIE EXCHANGE TIP: Turn this batch of gingerbread dough into Red-Nosed Rudolph Cookies or Tuxedoed Gingerbread Polar Bears. 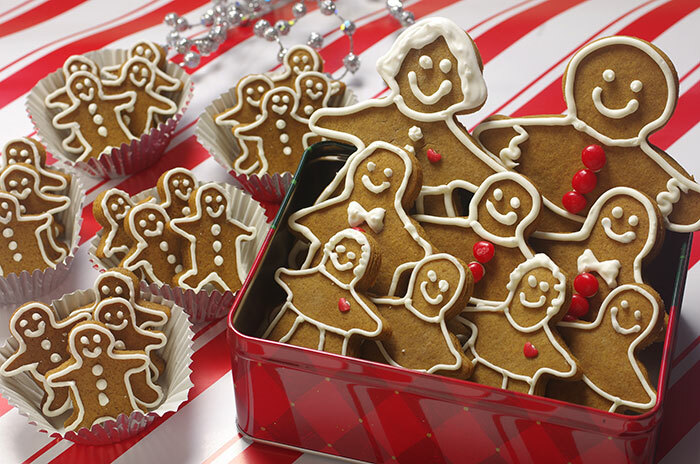 Or stick with tradition and cut out gingerbread men and women and decorate with icing. 1. 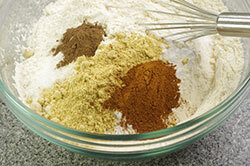 In a medium bowl, whisk together the flour, baking soda, salt, ginger, cinnamon, and allspice. Set aside. 2. 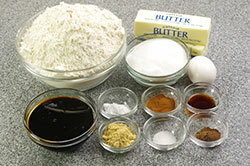 In a large bowl, with an electric mixer, beat together the butter and sugar on medium speed until light, 2 to 3 minutes. 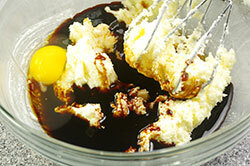 Beat in the molasses, egg, and vanilla. On low speed, gradually beat in the flour mixture just until mixed. The dough will be medium-stiff but sticky. If it is too soft, beat in additional flour, a tablespoon at a time. 3. Divide the dough in half. Pat each half into a thick disk and wrap separately in plastic wrap. Refrigerate until firm, at least 1 hour or up to 1 day. Let stand at room temperature for 10 minutes before rolling. 4. Preheat the oven to 350°F. Lightly grease or spray cookie sheets. 5. 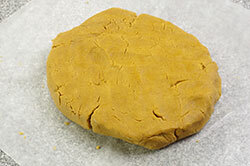 Place 1 dough disk on a lightly floured pastry cloth or board, and roll out 1/4 inch thick. 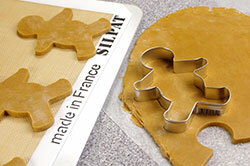 Using 4-inch people-shaped cookie cutters or other shapes of choice, cut out cookies. Using a large spatula, carefully transfer the cookies to a prepared cookie sheet, spacing them about 1-1/2 inches apart. Repeat with the second dough disk. Combine the scraps, reroll, and cut out more cookies. 6. Bake in the center of the oven until firm and just turning golden on the edges, 10 to 15 minutes. Let cool on the cookie sheets for 1 to 2 minutes, then transfer to wire racks to cool completely. 7. Decorate the cooled cookies with the icing and the sprinkles and candies as desired. This is the “glue” that holds gingerbread houses together and makes it possible to pipe fine designs in relief. Once it is dry, it is hard and virtually indestructible. 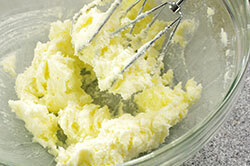 Using pasteurized or dried egg whites eliminates the small risk of salmonella from raw eggs. 1. In a bowl, with an electric mixer, beat together the egg whites and cream of tartar on medium-high speed until soft peaks form. 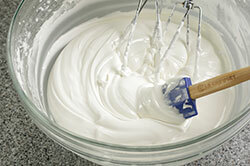 Gradually add the confectioners’ sugar, beating until a thick, glossy icing forms. On high speed, beat until the icing stands in stiff peaks, 3 to 5 minutes. 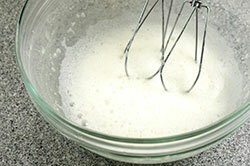 If the icing is too soft, beat in additional confectioners’ sugar, a tablespoon at a time. If it is too stiff, beat in water, a teaspoon at a time. 2. Use immediately, or cover tightly and store at room temperature for up to 2 days. (Do not refrigerate). 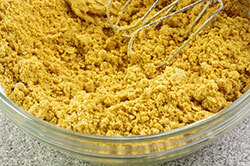 It will become spongy during storage, so beat again briefly with an electric mixer on medium speed before using.